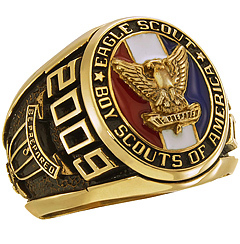 Personalize the Boy Scouts of America Eagle Scout Award ring with your choice of side emblems and engravings. This ring is officially licensed by the Boy Scouts of America. The ring top width is 19mm, palm width is 7.2mm. Handcrafted to order. Import.